Unique keyboard wrist rest with imbedded trackball. Two mouse buttons. Gel wrist pads maximize comfort. Installs using PS/2 or USB interface port. Black/Gray case, Turquoise Ball. 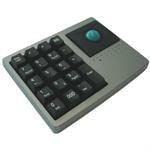 Full 19 key keypad with built in trackball. Three mouse buttons. Great with laptops. Excellent for presentations. Installs using USB interface port. Beige/Black case, Blue ball. Full size mechanical keyboard with optical trackball. We love this keyboard! Nice feel, great integrated trackball with three buttons, good wrist support. All black. 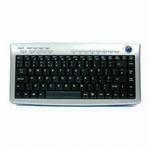 Ultra slim keyboard with trackball. Three mouse buttons. 18 Multi-media hot keys. Great for presentations. Installs using USB interface port. Silver case. Black ball. 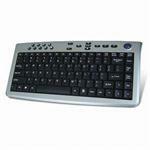 Slim industrial keyboard with optical trackball. 2 mouse buttons. 19" rack mount compatible. Great for control applications. Installs using PS/2 interface port. Black case. Black ball. 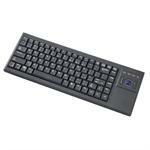 Slim industrial keyboard with optical trackball. 2 mouse buttons. 19" rack mount compatible. 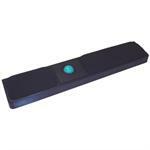 Great for control applications. Installs using USB interface port. Black case. Blue ball. 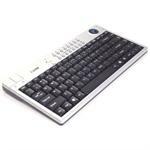 The Solidtek Mini Trackball Keyboard is especially designed for Windows, it has built-in trackball for mouse emulation, 88 keys keyboard with embedded numeric keypad and 12 dedicated function keys. 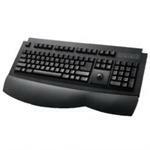 Ultra slim wireless multi-media keyboard with trackball. Two mouse buttons. 16 multi-media hot keys. Great for presentations. Range up to 40'. Receiver installs using USB interface port. Silver/Black case. Blue ball.